New Zealand’s South Island is often described in superlatives and, as we discovered, with good reason. 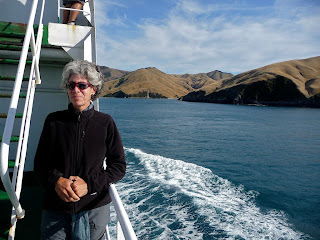 We boarded a ferry in Wellington and made the 3 plus hour ferry ride with our car. 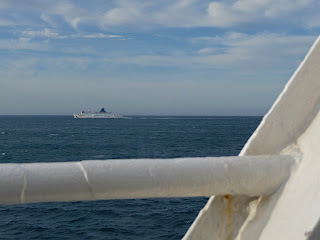 The ferry ride was reminiscent of our Pacific NW ferry rides. 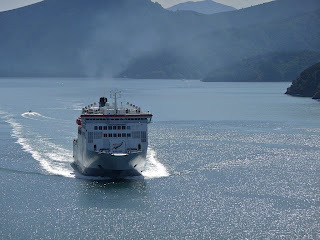 It started with almost an hour’s transit out of Wellington harbor with wild rocky scenery, then there was a little more than an hour of open water crossing during which we had 25 knot winds that drove us inside to watch the silly movie being shown. The final hour was spent transiting Marlborough Sound which reminded us strongly of the passage from Anacortes to Sydney via the San Juan and Gulf Islands—if you don’t know the area, suffice to say it is gorgeous! The land and islands were partially forested and virtually uninhabited with steep hills down to the water. As everyone had warned us, we wished we had our sailboat there. We felt our time was running short so we just tried to skim the surface of the sites we might want to return to. 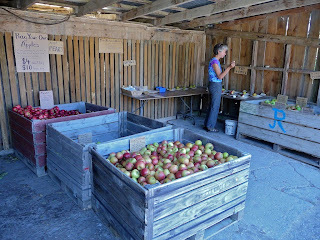 We blasted through Nelson, an arty community, past apple orchards and vineyards, stopping only to pick up some fresh, crisp, delicious seasonally fresh New Zealand apples (mmmmm) and look at a fabulous glass gallery. Many of the roadside stands in NZ use an honor system. Stands are set up, prices are listed and there is a box to deposit your payment—often there is no merchant there to collect. We headed right for Abel Tasman National Park, a little gem of a park that would have been perfect for a kayak/camp trip—many are organized there, but we just took a water taxi up the coast as far as we chose to walk back and did a day hike with another couple we met at our campground. As it turned out, Shirley and Brant just gave up the cruising life last year and we knew several boats in common. The 10 mile or so hike was on well developed trail and was stunning, passing several gorgeous golden sand beaches. We had beautiful, sunny weather. Christchurch was next, both to visit one of our cruising buddies Paul (and Gina, but she was back in the US working), and to get our car’s heater checked out. It turns out that the heater repair is a huge, labor intensive job, so we scheduled it for the following week and continued on our way. 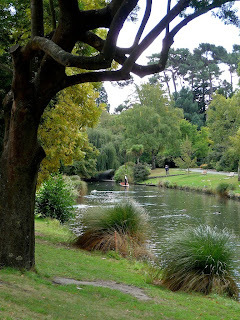 Meanwhile, Christchurch provided many galleries and a lovely botanical garden. 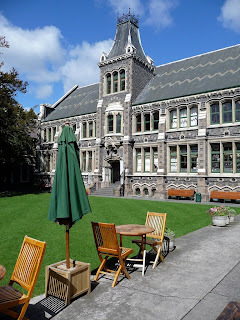 The little storm from Antarctica which we experienced in Wellington had left a cold spell in its wake and our day in Christchurch was freezing—the night reached 3 degrees Celcius and the mountains in the distance were suddenly dusted with snow—winter approaches. 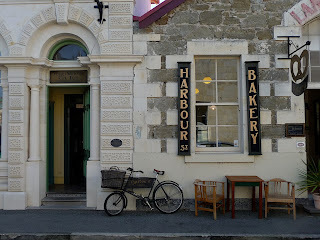 Finally we arrived in our soon-to-be home, Oamaru, down the coast from Christchurch. The town of 15,000 people has a fairly benign climate and attracts a retirement community, more elderly than elsewhere in NZ. It is known for its limestone buildings constructed during the Victorian era which are picturesque in the extreme. The town somehow froze in that era and is now re-created for tourism. And the tourism focuses on one of its unique little features which is the penguin colony which comes ashore nightly just on one end of the Oamaru harbor. 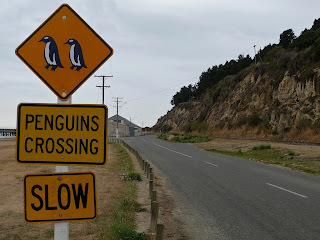 One cannot spend a second in Oamaru without seeing some reference to penguins. This colony consists of the smallest penguins in the world, the blue penguin, only about a foot tall as they waddle up the beach. We’re here to tell you that they are cute as the dickens though we had first seen them in the Bay of Islands on the North Island. I spent an afternoon and part of the next morning at the hospital doing paperwork and meeting my future colleagues. Everyone was incredibly friendly. Richard met a local wool merchant who taught him, and later, me, a bit about the variety of wool produced by the amazingly diverse breeds of sheep here in NZ. He also let Richard know about various “bloke” activities engaged in locally like going out and shooting Wallabies (another introduced pest—a group of 14 guys dispatched with 240 of them one evening). Richard and I also spent time sightseeing and got to see our future house, a 2 bedroom place nestled in a lovely if a little overgrown garden full of roses and fruit trees (apple, pear and plum). The second night there I was determined to meet our little penguin friends so we went down to the carpark at the harbor and, rather than join the tour, we joined 20 or so other cheap people who waited for the straggler penguins who come in somewhere else than where the tour goes. We were lucky just after dark to have a couple penguins come ashore just where we were all waiting quietly. A few gawkers couldn’t help but take pictures which made the penguins freeze in alarm, but, at some unspecified signal, everyone present suddenly became quiet and froze in place and the penguins cautiously advanced up the shore. They waddled past several of our legs within inches, hiding in the shadows we cast from the nearby building lights. They were, well, sooooo cute!!! We took the Moonlight Track past the Moonlight Valley and encountered very few other souls on the tramp. 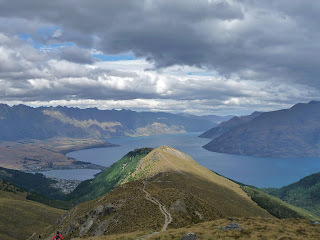 When we finally crested Ben Lomond Saddle and dropped into Queenstown to pick up the gondola ride the rest of the way down, we suddenly found others on the trail. But before that, only a few hardy souls and a few cows and sheep. It was 6 hours spent in paradise. 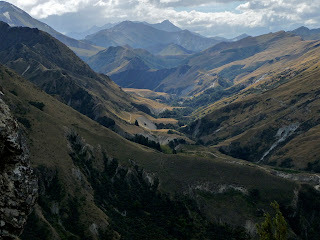 We left Queenstown with a list of things left to do (canyon swing is still on the list) but time was running short. 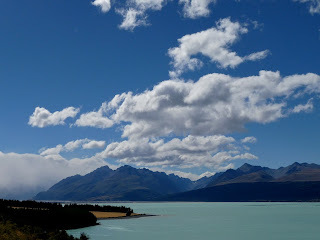 We headed toward Mt Cook hoping to catch a glimpse of NZ’s tallest peak, but, although we drove on a sunny, gorgeous road along the lake that leads up to the peak, just after the visitor center, apparently the evil spirits of Mordor descended upon us and a curtain of broiling clouds and rain obscured our view. Oh well, another visit for another time. The scenery we saw was fantastic enough minus the full view—what a teaser! Next stop is the US for a whirlwind visit with friends and family and then we’re back to start work in Oamaru and live like Kiwis for the rest of the year, which becomes winter in a couple of months.